A focal ulcer of the urothelium, with inflammation of the underlying submucosa and muscularis layers, from a male B6C3F1 mouse in a chronic study. 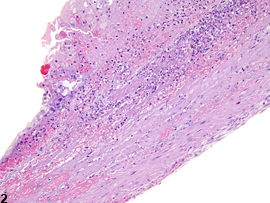 A focal ulcer with extensive necrosis and acute inflammation from a male F344/N rat in a chronic study. Ulcers may result from a number of etiologies, such as direct chemical exposure or as secondary lesions associated with inflammation, calculi, or tumors. 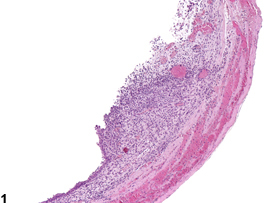 Ulcers usually progress from urothelial erosions/necrosis and extend through the width of the urothelium, resulting in subepithelial hemorrhage and inflammation ( Figure 1 and Figure 2 ). The severity of the inflammation depends on the size and the chronicity of the ulcer. Acute ulceration may develop rapidly. Regenerative hyperplasia and/or fibrosis may be observed in chronic cases. Ulcers should be diagnosed and given a severity grade. Inflammation and/or regenerative hyperplasia, when significant, should be diagnosed along with ulceration as an indicator of the chronicity of the lesion. Gopinath C, Prentice DE, Lewis DJ. 1987. The urinary system. In: Atlas of Experimental Toxicologic Pathology. Current Histopathology Vol. 13. MTP Press, Norwell, MA, 78.